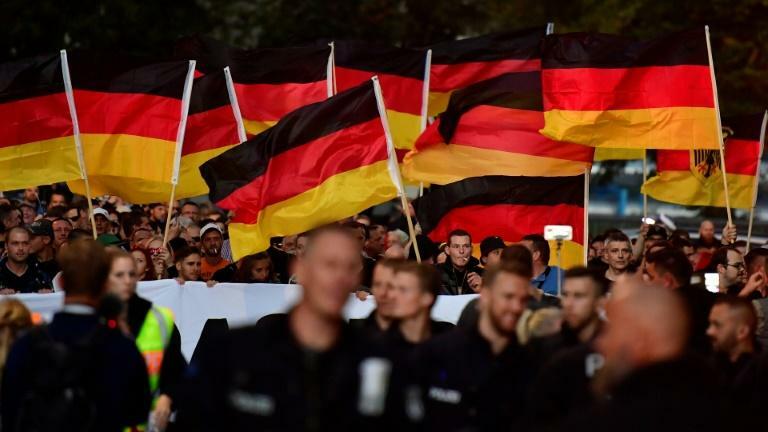 "I don't care if they call us racist but things simply cannot carry on this way," said Paula Neubach at a far-right rally in the flashpoint German city of Chemnitz, rocked by anti-foreigner violence since late August. Extremist groups and thousands of locals have taken to the streets since a fatal knife attack on a German man allegedly by asylum seekers, with many participants shouting anti-foreigner slurs and flashing the illegal Nazi salute. Mobs have also assaulted reporters and police, sparking counter-racism demonstrations and prompting German Chancellor Angela Merkel to declare that "hate in the streets" had no place in Germany and that vigilante justice would not be tolerated. "It's normal to help people who have fled war in their country," said 55-year-old Sabine Sterben, standing near the rally late on Friday. The city in the former East Germany has been polarised over the question of migrants since Daniel Hille was stabbed to death on August 26. The 35-year-old carpenter was repeatedly knifed and his suspected attackers, according to police, are three Iraqi and Syrian asylum seekers. The far-right has seized on the attack as further proof that crime and insecurity have soared since Merkel opened the borders to millions of asylum seekers three years ago after Europe's worst migration crisis since World War II. They are also calling for a "peaceful revolution" to change what they call the "Merkel system" and held a rally in Chemnitz late Friday like in the past week. "We are not Nazis! ", said Daniel Reichelt, 55, who was one of the 2,000-odd people who turned up at Friday's demo. He brushed off the Nazi salutes in earlier rallies as a "mistake", adding: "There are bad people everywhere. "I've had enough of the social and economic inequalities" in the former Communist east, he said. "Salaries and pensions are still lower than the West and we don't have work," he said. Neubach came specially from Berlin to attend Friday's rally and laid flowers at a makeshift memorial where Hille was killed. "One cannot enter another country and kill people," she said. A few metres away stood an imposing statue of Karl Marx with his famous slogan "Workers of the world unite" written in four languages. Meanwhile, a counter-demonstration by the far-left took place nearby with police and barriers separating the two sides to pre-empt clashes that have broken out in the past. Sabine Sterben said she could not understand how the city, formerly named Karl-Marx-Stadt, had changed so radically. "I never thought there would be so many extremists in my city," she said, adding: "It's really important to take a humanitarian position." 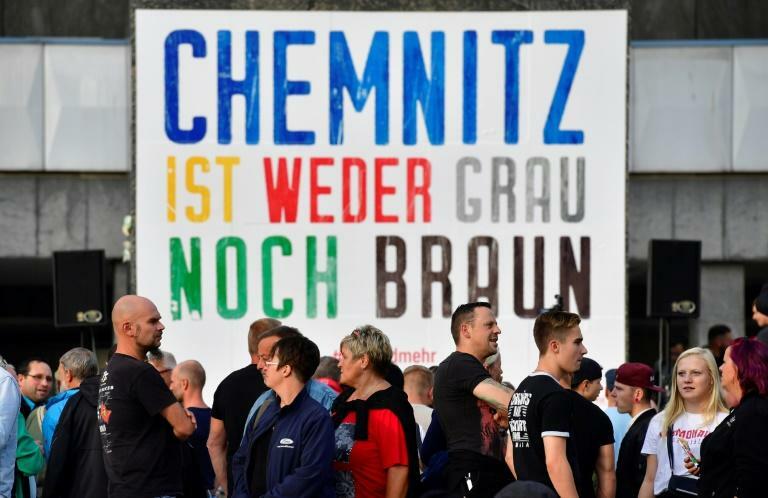 The divide in Chemnitz is also playing out across the country and has even rocked Merkel's government with the conservative Interior Minister Horst Seehofer backing the right-wing rallies. "We are not racist. I myself have Arab friends but crime has exploded since the migrants arrived," said Uchi Tuhlman, 43. Official figures however show that crime has actually declined during this period. "We just want to reclaim our city," said Tommy Scholz, 31. "We are just patriots, we don't want violence and we are fed up of keeping quiet." This tide of xenophobia does not surprise historian Klaus-Peter Sick, who specialises in the far-right. The former East Germany "was less open to the rest of the world and people encountered foreigners less," he said. "East Germany has remained more German than the West," he said.